If you are looking for a wedding destination with a difference then look no further than the Axe Valley in East Devon. Snuggling on the edge of the Blackdown Hills, an area of outstanding natural beauty, this is still a hidden gem. The magnificent Shute Barton is an ideal location. Owned by the National Trust, this medieval house is tucked away in the small village of Shute. Shute Barton itself is open to the public just a handful of times in the year. It is now an amazing holiday let, sleeping up to ten guests, with five bedrooms. A marquee can be accommodated in the extensive gardens, with several beautiful places to stay for your guests in the very pretty, nearby town of Colyton, home to the Monmouth Rebellion of 1685. Choose beautiful, simple flowers. For a late winter–early spring wedding, I have chosen daffodils, Ranunculus and narcissi that could have been picked from the garden. 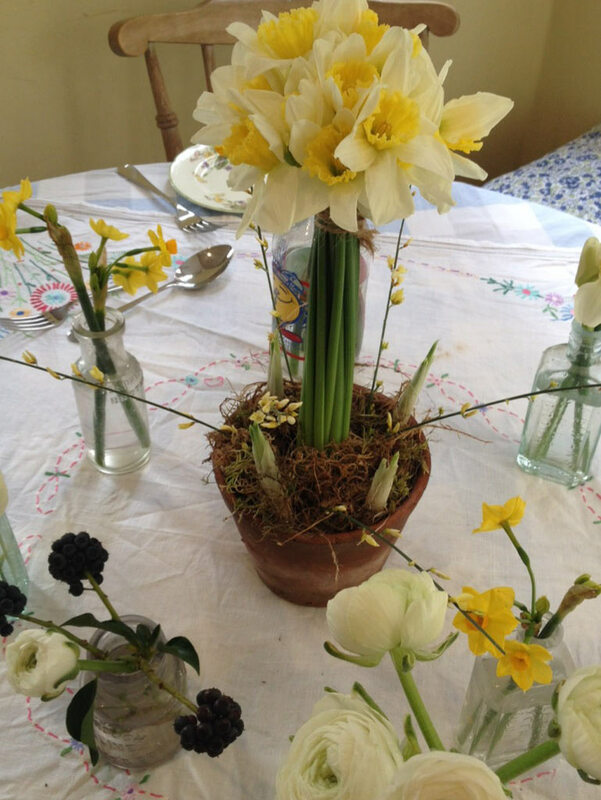 A late winter-early spring table arrangement with daffodils, Ranunculus and narcissi. If it is a summer wedding then choose sweet pea, cornflower, Hydrangea and English roses. 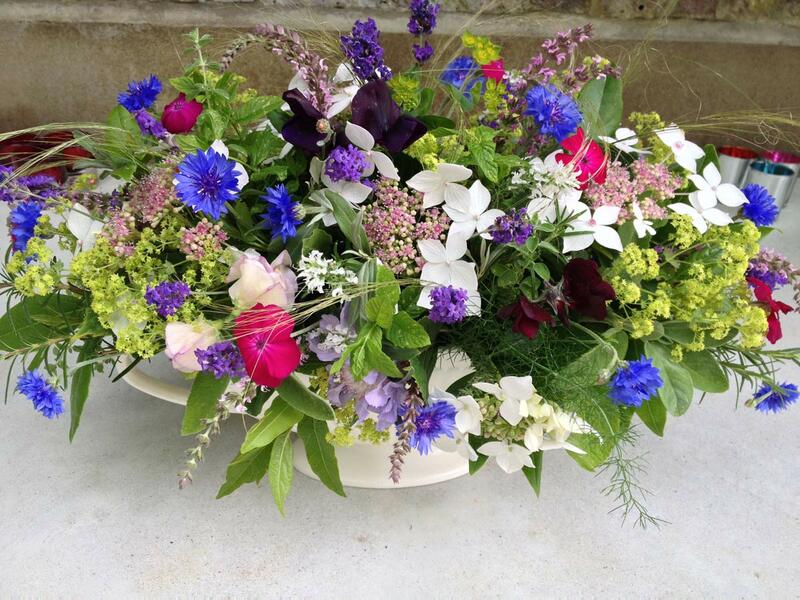 Cornflowers and sweet peas in a summer arrangement. 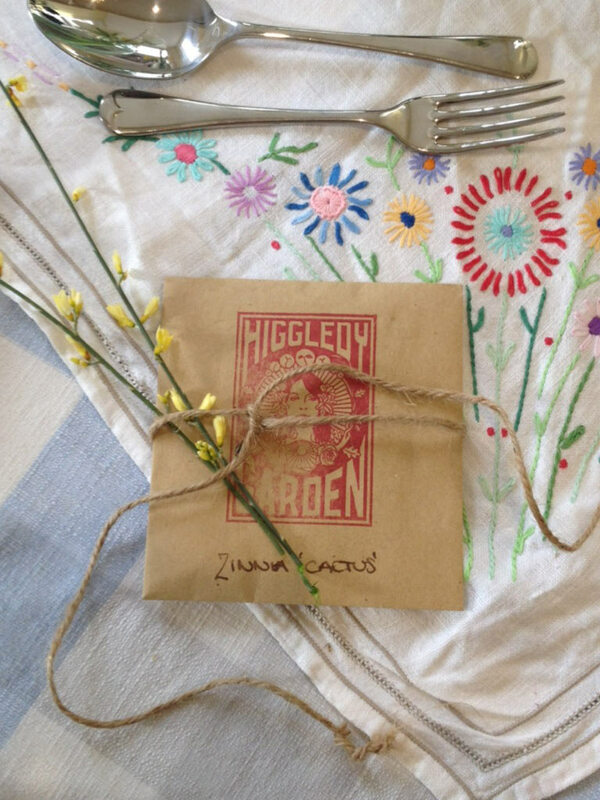 Then give each of your guests a packet of cut flower seeds as favours from the wonderful Higgledy Garden, based in Cornwall. The packets the seeds come in are almost as lovely as the flowers they promise. Wedding favour with flower seeds from Higgledy Garden. Arrange a day out after the wedding brunch on the fantastic Seaton-to-Colyton tramway. Take a stroll through the picturesque village of Colyford, where you will pass the petrol station where Lawrence of Arabia stopped in the 1920s to fill his motorbike with fuel. Drop in at the lovingly restored 15th century Wheelwright Inn, before continuing your tram journey. 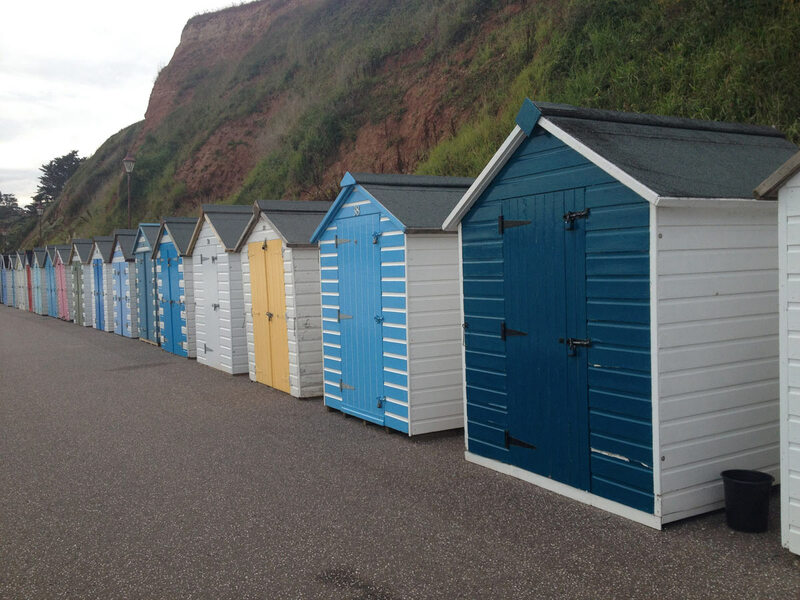 Stroll along the beach at the small coastal town of Seaton and explore the quieter, but no less beautiful gateway to the Jurassic coastline. Beach huts at Seaton seafront. This area of Devon is sometimes forgotten, but no less enchanting, why not explore! !